Is there an easier way to clean soft serve machines? Yes! Hydra Rinse™ allows for more efficient, and 100% natural cleaning of soft serve machines. Previously, cleaning soft serve ice cream machines was a labor intensive process. 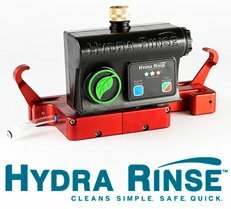 Hydra Rinse™ offers a standardized and automated process. Hydra Rinse™ "Cleans simple, safe and quick." The one touch automation of this technology is a game changer for previous methods of machine cleaning. Cleaning is simple with minimal training required, provides fast set up and reduces cleaning time by up to 67%. Hydra Rinse™ uses no harsh chemicals. Instead, Hydra Rinse™ uses a 100% naturally derived cleaning solution. Who wants their soft serve machine cleaned with toxins? "Hydra Rinse™ has changed our way of doing business. 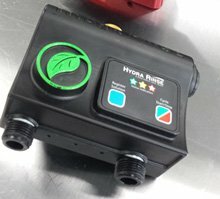 It has taken a time-consuming, dreaded task and transformed it into a time-saving, simple, and safe solution"
Finnovation Product Development, LLC worked with Idea Boxx, LLC to produce functional parts for the development phase of Hydra Rinse™. The engineers and designers at Idea Boxx required their designs to be created quickly and accurately for functional testing to validate their designs prior to tooling and manufacturing. The 3D Systems sPro 60 SLS Center delivered functional parts in as little as 24 hours to ensure that the design process went smoothly as well as cost effectively. Shown here is an actual part assembly made with 3D Systems' cutting edge SLS additive manufacturing technology. For more information on Idea Boxx, LLC and Hydra Rinse™, please click here . Contact Finnovation Product Development to incorporate 3D Systems high tech Additive Manufacturing solutions into your design process.